MRI safe goggles for viewing during studies where metallic glasses would be unsafe or cause unacceptable data artifacts. 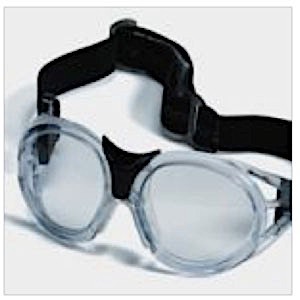 These all-plastic goggles come with a comfortable adjustable head strap and silicone face pads for supreme comfort. The ergonomic face-contoured frame allows for use even in smaller MRI RF coils. The goggle set comes with an adult-sized frame, set of prescriptive lenses, vision chart, lens cleaning kit, and a plastic storage case for easy handling. Lenses separately marked with power strength for easy identification. Correcting patient vision has previously been problematic in certain diagnostic and research environments. It is often not possible for patients to wear their own glasses because of various technical and safety reasons including, data artifacts, burn risk and magnetic safety. It can be very disorientating and frightening for patients not to be able to see clearly in unfamiliar and potentially hazardous environments. Our goggles are quick and easy to customize to your subject's prescription with an easy lens change system and graded lens powers (range from -5 to +3 diopter in 0.5 diopter increments in a customized set). The design offers comfort and security with an adjustable head strap and silicone nose/face rests. Lens sets can be customized, with optional filtering lenses, coatings and surfaces or Bi-focal. Complete with storage case, and lens cleaning cloth and solution.